My job as a teacher occasionally takes me to various places in Europe to chaperone my students on school trips. One of these places that I've been to twice now is Salzburg, Austria. Both times have been great! Salzburg is a beautiful city close to the Alps with great history and culture. Last year the weather was sunny and beautiful, but this year it drizzled off-and-on. Still, despite the unpredictable spring weather, the city has plenty to do both inside the limits and outside along the borders. Now traveling with a school group is a bit different from traveling on my own. I don't get anywhere near as many opportunities to dine out. Still, we do some pretty cool stuff, and I feel it's worth mentioning some of the things we do as a starting-off point for others wanting to visit Salzburg. But first, it's worth talking about the hostel experience. As an American, it would never cross my mind to stay in a hostel. Maybe this is because of our family's socio-economic status as I was growing up or maybe America really hasn't caught onto the hostel bandwagon yet. I'm not sure. Either way, I've been pleasantly surprised by all of my hostel stays in Germany and Austria. The concept is simple. You pay a reduced fee to stay in a tiny room or bed by yourself (a single and usually with a bathroom) or with a small group, usually of your friends (in which case you share a bathroom). I've been in hostels in which you have to bring your own towels and hostels in which towels are provided for you. It all just depends. Of the three hostels I've been to with school groups so far, all were clean and safe, and the kids go to bed (by the hostel's rule) at 10 pm, so you get some peace and quiet in the evenings. The view from the hostel. The hostel we stayed at in Salzburg, JUFA Salzburg City, was particularly nice. The rooms were more up-to-date and the beds were comfier than most. You also got a towel and hand cloth for your stay. The lobby included a small snack store and a café where you can buy coffee, beer and wine, and even pizzas. For the adults there are conference rooms and plenty of seating on the lobby couches and patio (which has a fine view of the castle), and for the kids there's a playroom, foosball table, ping-pong tables, and large field for sports. Perhaps most importantly, the food is actually decent. As part of our stay, we purchased three meals a day. 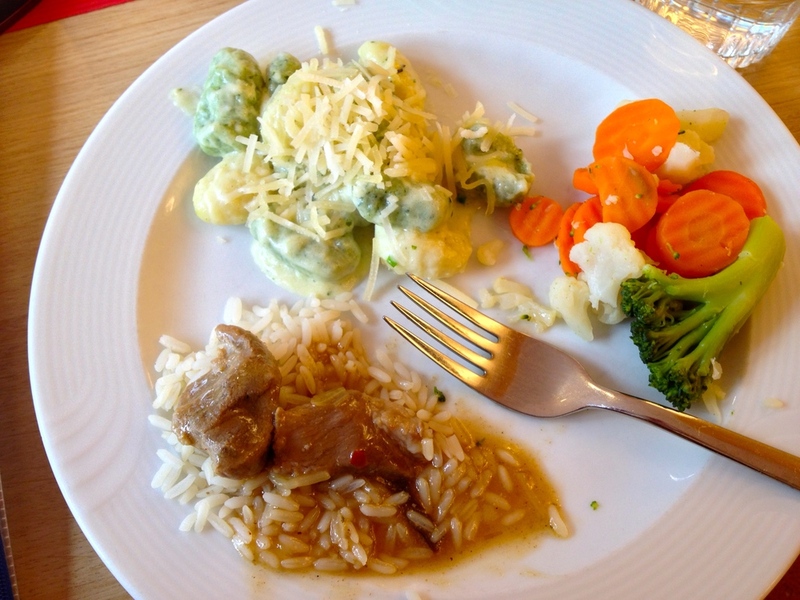 I've had some bad hostel food before, but these meals were actually tasty. The breakfast buffet always included the traditional cheese, meat, and roll spread, cereals, butter and jams, scrambled eggs, hard-boiled eggs, and bacon. Lunch and dinner usually included two hot selections, one meat and one vegetarian, a salad bar, two soups, and a dessert bar. Of course this is still a cafeteria and the meats can be dry while the steamed vegetables can be overcooked, but we had a lovely roast beef one night and the cream of asparagus soup was fancier than anything I'd ever seen come out of my high school cafeteria. You can see examples of some of the meals I ate below. Apart from the cost, the JUFA Salzburg City is nice because it's just a short, 5-10 minute walk to the old city next to the castle. Salzburg really is a good city for walking, making this hostel super convenient. Hostel aside, here are some other recommendations that I've compiled from my recent trip this past week, as well as our trip from last year. Remember that we were with a school group, so I'm sure there's a lot more to see and do for couples on their own, and Matt and I plan to go together sometime in the future so he can see the city, too. Hohensalzburg Castle - This Medieval castle was inhabited by the archbishops of Salzburg. We take the students up the hill for a tour in English and quick sketching session every year. The English tour is definitely worth it, as you get to see some of the beautiful rooms and possessions of the archbishops (including their toilet that hovers over the side of the castle hill). The views are impressive as well. You can walk up the steep hill yourself, though the funicular might be better for the elderly and disabled. Altstadt - The old city is a great area to walk around with all of its winding side streets. There are tons of shops, cafés, and even a market or two to satisfy your food and gift needs. Be sure to check out the Salzburg Cathedral, St. Peter's Cemetery next to the Abbey (where they filmed some of the escape scenes in The Sound of Music), and Geteidegasse shopping street with all of its gilded hanging signs. Mirabell Palace and Gardens - The Mirabell Palace is a Neoclassical-style palace that was built for one of the Archbishop's mistresses. We visited the palace last year to hear a Mozart concert. The performance room was a gorgeous salon with great acoustics, and the show was definitely impressive. The palace gardens are lovely to walk around in if you need a break or if you're curious to see one of the locations where The Sound of Music was performed. Berchtesgaden Salt Mine - We've been here twice and have loved it both times. The tour requires you to suit up in some hilarious jumpsuits, and then takes you on a train, down some slides, across an underwater lake on a boat, and through the salt mines. Apart from the novelty of being in a mine, you get to learn using through light shows, videos, and interactive computer stations how the salt was formed and is mined. Sound of Music Tour - We always get our own tour bus with Panorama Tours when we're in Salzburg, but I've also seen lots of hop-on, hop-off buses in the city. Some of the sights include the gazebo where "I Am Sixteen" was filmed, the Salzburg Lake District where some of the panoramas were filmed, Mondsee where the wedding chapel is located, and more. The breathtaking sights and fun times singing are well worth it. Last year we were also fortunate enough to get a quick trip in on a toboggan run, which I highly recommend if you get the chance. Spielzeug Museum (for kids) - The Toy Museum was a last minute choice, but turned out to be a great one for kids. There are tons of games and activities to occupy the little ones all the way up to older kids. Our students are all around 13/14, and while some of the boys were too cool for the games, the girls just loved it. You can find three levels of dolls, trains, cars, dollhouses, building blocks, games, slides, and more. Best of all, while the kids are playing, the adults can walk around and learn about the antique toys on display. St. Peter's Stiftskeller Mozart Concert - This year we decided to take the kids to a dinner concert to give them something to do while they listened, and boy was it a success! Most agreed that this was one of the best parts of the trip. The idea is that you get to eat a fabulous three course meal made up of 17th century recipes while you listen to pieces from Mozart's operas performed by live musicians and singers. The menu we had included white lemon soup with curd cheese-rosemary dumpling; breast of capon with a red wine glaze, potato gratin, semolina strudel, and vegetables; and semi-frozen parfait of forest honey on two different sauces. This was the first time I'd ever eaten capon (castrated cockerel) and it was tender and juicy with a beautiful presentation. Be forewarned: the dinner price does not include drinks and tip. Sporer Liquor and Spirit Bar - A friend and I stumbled upon this place in the altstadt (old city) when given some free time. The bar is compact--one small space in front of the bar and a tiny back room--but the customers don't seem to mind. We saw some locals there two days in a row enjoying the Austrian wines, liquors, and schnapps. I highly recommend the Enzian (gentian) schnapps for a cold and the mocha (coffee), holunder (elderberry), or zimt (cinnamon) schnapps for something yummy. They also sell small bottles by the door, so you can take a bottle of your favorite (or two) home. Café Tomaselli - This café in the old city has been there for over 150 years. Since the weather in Salzburg can be unpredictable, it's often necessary to stop somewhere for a coffee and get out of the rain or cold. Our first year, I had the best hot chocolate with a shot of rum to warm me up. This place is not to be missed! Café Konditorei Fürst - I've been told that the Fürst Mozartkugel are the first (no pun intended) Mozart "balls" from Salzburg. Unlike the red ones that you see in grocery stores all over Germany and Austria, these have a smaller pistachio marzipan core surrounded by a thicker layer of nougat in a hand dipped shell with blue and silver foil. They make excellent gifts to bring back to loved ones. There are three locations in the city.